It's not exactly news that mobile devices are quickly becoming one of the most popular ways to consume data. From Twitter feeds to RSS, it's becoming increasingly common to see people reading on their devices, whether it be a tablet, e-reader or phone. However, a problem I ran into was that not all web sites are optimized for reading on a mobile device. While some sites have the decency to have a mobile theme, others load in full view and have trouble wrapping text to a zoomed-in screen. Dealing with page formatting while reading long articles wasn't something I felt like doing, so I began looking for alternatives. 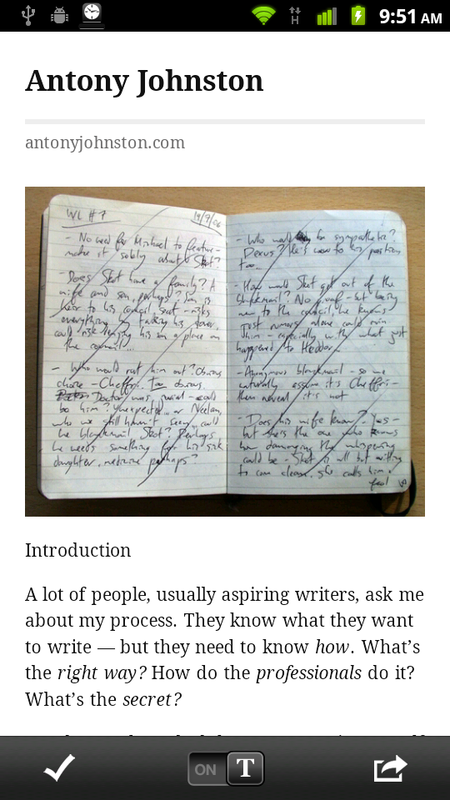 Furthering my search was learning about Rdd.me from Lifehacker; as a free version of the Readability service, the site would take any web page and strip it down to its text elements, along with any in-line pictures. While this lead to an immensely-better reading experience, Readability wants $5 per month for their mobile option. I set my sights on finding something cheap, Android-capable and capable. And damn, I found it. 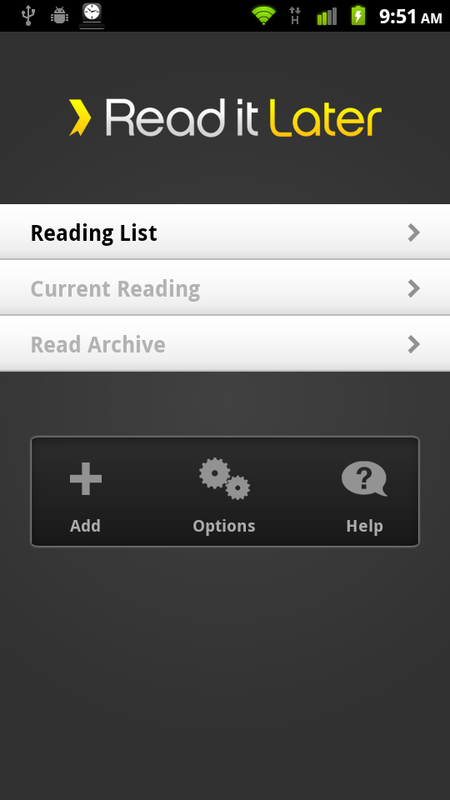 I've been using ReadItLater on my phone for close to a month now, and I can't say enough good things about it. Basically, it's gotten me reading more on my phone through some awesome cross platform features and a simple addition/removal feature that keeps things from getting too complicated. ReadItLater acts as a conduit, an extension to the desktop service, which operates via browser bookmarklet. 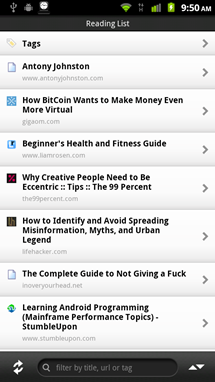 By copying the custom shortcut to your bookmarks toolbar, you can add any article to a central reading list after the removal of text elements like ads and layout. From there, you're left to read your article without any distractions. 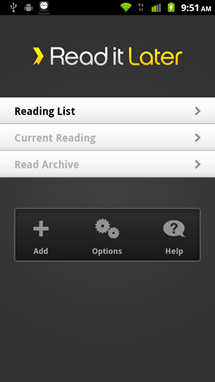 Your reading list is tied to a central login, and syncs to your phone when you install the application. Your articles are downloaded from your list for offline reading, and are accessible at any time, regardless of data connection or not. You have the option reading your article in an in-app browser by moving the "T" slider left, turning off text view. Eliminating articles (one done) is simple as clicking the checkmark in the bottom-left corner of the screen. They're moved to an archive, so you can re-read them later if you want to. 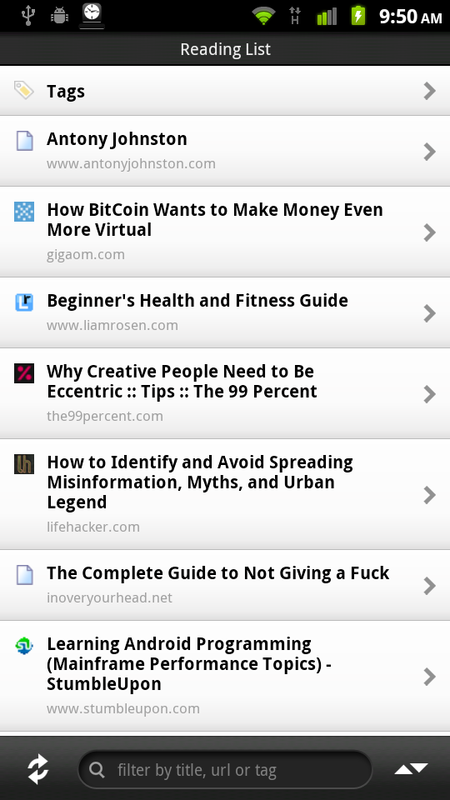 The button on the bottom-right allows you to share articles using other apps on your phone. Articles can be tagged and searched for via that tag; however, they aren't prompted for when you add an item. This is really important, as it affects the usability of the app. A main barrier that usually happens with these types of services is that they fail to integrate themselves into my daily life. They complicate themselves needlessly and it becomes more of a chore to implement them, instead of a habit. 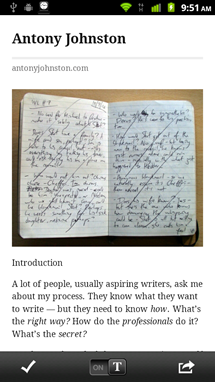 ReadItLater won me over because it's simply easy to use. Whether it's a bookmarklet, Chrome extension, Dolphin HD plugin or a link in the "Share" menu, adding items is usually a one-click affair. Because I'm not prompted to title or tag articles right away, which allows me to stop worrying about it and actually get on with reading the piece. That's what I'm ultimately using the app for: to escape from all the distractions that tear me away from a tab, leaving it unread. 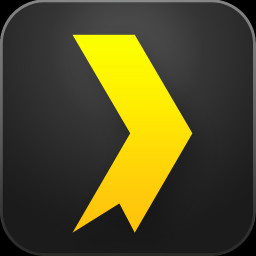 The simple formatting and offline sync make this app the perfect subway companion; add a bunch of articles before you leave the house, let them download during your walk to the station (or on Wi-Fi only, via settings) and read them while you're on your commute. ReadItLater is on the App Market for $2.99, but it should be noted that this is a launch sale price. This service is something I would gladly pay more for; three bucks is a bit of a steal. I'd pick it up while the picking's good.